Music+ is all set to guide and facilitate another music and yoga retreat in the far-reaching Himalayan range which spreads into thousands of miles, and holds within it an exceptionally diverse ecology! After successfully conducting an intense and rejoicing retreat in the foothills of the Himalayas in Almora (India) last year in October (https://goo.gl/w9eYS1), the Music+ team is all geared up for an even more overwhelming and nourishing experience up in the Himalayan kingdom of Nepal. Sudhanshu Sharma – an internationally respected Indian Classical Musician and Vocal Teacher and Chetana Meehan, a leading practitioner of Yoga and meditation, along with their team of dedicated and talented musicians are going to take you yet again through a deep immersion into Nāda Yoga – the Yoga of sound. This 10 glorious days Retreat based on the inherent power of sound and voice will be a lifetime experience towards the discovery of a new ‘YOU’. The village of Astahm, located approximately 20 km North-west of the town of Pokhara offers a spectacular view of the Annapurna-Machhapuchre-Dhaulagiri Mountain ranges. The snow covered peaks are seen shimmering above the green landscapes of dense natural forests. It is here that you will traverse on a journey of re-discovering your magical voice, your Himalayan voice! It is here that you will rejoice, rejuvenate and relax. The accommodation is simple and basic – the kind that is perfectly suited for the Sound Yogis. You will be housed in Single or Twin-Sharing rooms (as per your preference) whose windows face towards the snowy mountains and the gleaming green hills. The food will be organic, simple, healthy and delicious! The Nepali chefs shall prepare exotic vegetarian dishes to give you one of the most remarkable culinary experiences. The staple diet for Lunch/dinner would be the simple Dal-Bhāt-Tarkāri – translated as Lentil soup-Rice-curried vegetable. Apart from that you will be enjoying other foods of Tibetan, Indian and Thai origins. Fresh fruits from the Himalayan foothills and yoghurt mixed drinks will keep you refreshed throughout the day. The sheer joy of being able to accomplish that song, that Rāga, that musical phrase/idea you have been holding close to your heart since long. To be able to manifest and engulf yourself in the powers of your own voice, hitherto unknown and undiscovered. To be in the rejuvenating, soothing and pristine surrounding of the Himalayas is such bliss and a dream-come-true. To have an undisturbed, unabated, intense and rewarding musical practice (rarely practiced nowadays). No phone calls, no emails to respond to, nothing but 10 glorious days of Music and Bliss! 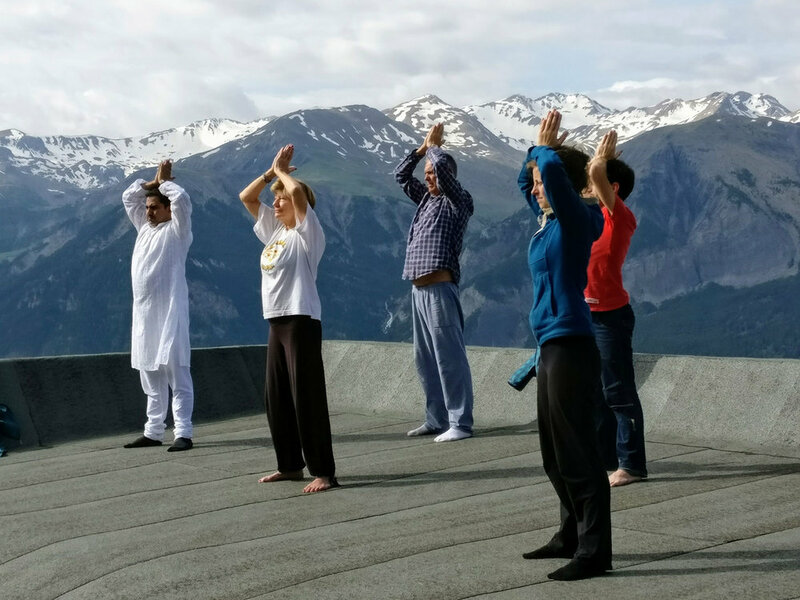 The retreat becomes a lovely exchange platform of cultures, tradition, ideas and perspectives with folks coming in from varied territories and different walks of life. Last, but not the least, those wonderful connections and friendships you will make with like-minded people from all over the world. This musical immersion in the Himalayas will definitely turn out to be a worthy decision for you! Delicious vegetarian food at the resort (buffet meals): from Dinner on day 1 to Breakfast on day 9. All Music, Yoga and Meditation classes: Raga Music, Cosmic Sound Activations, Yoga Postures, Meditation Practices. Any cancellations made up to 31st July 2018 will result in a loss of the non-refundable deposit of $650. Any cancellation made between 1st August and 15 October 2018 or no shows will result in a total loss of funds. We reserve the right to cancel the trip if it is not meeting the trip minimum (if we do your money will be refunded in full). If you wish to cancel your reservation, it must be done in writing or via email and the cancellation will be effective as of the date MUSIC+ Retreats receives it. Trip cancellation insurance is always recommended whenever making travel plans.